One of our community grande dames, MMHoney, gave me three copies of the vintage Rumford Cookbook. Two of these copies are from the 1948 edition while the third is the 1918 edition. (The two copies in red above are the 1948 editions.) If you are a vintage cookbook collector, stay tuned. I HAVE A GIVEAWAY. I examined the cookbooks for clues. I’d never heard of Rumford! The first few pages tell us about Count Rumford. Benjamin Thompson was “the American ennobled by the courts of Europe because of his pioneer discoveries in cooking.” His accomplishments include being the first to study diet, to invent an effective oven, roaster, and tea kettle, to advocate drip coffee, and to suggest holes in the handles of pots and pans so they could be hung. He designed efficient kitchens, the modern air-tight stove, and the construction of oven doors. But is this all true? Was there really a Count Rumford? Or was he like Cap’n Crunch who sailed the seven seas in the good ship Guppy and discovered crunch berries? 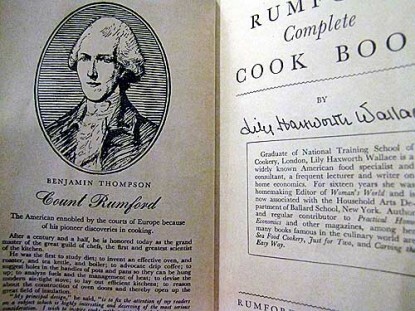 Count Rumford was, in fact, a real person, but the Rumford Cookbook was written by Lily Hayworth Wallace (a food specialist and consultant) for Rumford Chemical Works, which developed and sold Rumford baking powder. The first edition was printed in 1908 and it continued to print subsequent editions until the late 1940s. But my, oh my, do we owe them our cookies. And their cookbooks are a piece of culinary history. *Update to note: This is an interesting page here. Apparently sometime after 1950, Rumford changed hands again and is now owned by Clabber Girl while Calumet was taken over by Kraft. According to that site, Rumford is still available (who knew? not me!) in New England and the Northeastern U.S. (though it sounds as if from the comments it can be found elsewhere). I’ve never seen it. Now I feel obsessed with the idea that I need some. For a chance to win here: Leave a comment on this post and let me know you want it. ONE winner will be drawn from comments on THIS post by random comment number to receive one of the 1948 Rumford Cookbooks. Eligible entry cut-off is midnight Eastern (U.S.) time tonight (December 13). This post will be updated with the winner by 9 a.m. Eastern (U.S.) time tomorrow (December 14). Return to this post to claim your prize! For a chance to win the other 1948 Rumford Cookbook, go to my Cooking section at CITR and leave a comment there for another shot! UPDATE 12/14/10: The winning comment number, drawn by random.org, is #17, Leah. Email me at CITRgiveaways(at)random.org with your full name and address for shipping! Find the other winner at CITR in my Cooking section here. Would love to win the Vintage Rumford Cookbook! I would SO love this book! Vintage cookbook are one of my weaknesses. Shortly after I moved to WV, I was blessed with over 20 years of the annual cooking insert from the Parkersburg newspaper…a little bit of my “almost heaven” that I’m still exploring. I’d love to win “The Rumford Complete Cook Book.” Thanks for the chance. Suzanne, any chance of convincing you to scan the 1918 version for Project Gutenberg? I’d love one of these old cookbooks. Hurray! I get another chance! Please enter me. P.S. I think the Project Gutenberg suggestion is a great idea. Here I am again – lovin a second chance to win. Thank you! The book sounds interesting and I would love to win it. Would LOVE to have that cookbook!!! I love cookbooks and would love to add this one to the many I already have. I read them just like a paperback book. I would love to win the cookbook. It would be nice to try a new recipe while it is so cold. The cookbooks are great. I would love to have a copy and see what people were serving up back then and also to have a little piece of the history. Would love to have this heritage cookbook. What a find! I would love to have this book for my collection! What a great give away – please put my name in! I would love to get this! Having a crummy day and this would brighten it up! I have heard of and used Rumford baking powder, but I had no idea of the man/history behind it. The cookbook sounds fascinating! I would love to win this cookbook! I love all cookbooks, but especially the old ones! What a neat book this would be to own! Indeed – count me IN on the drawing!! Not sure if I have seen the baking powder, one of the cookbooks, or what, but as your story was unfolding, something sure felt familiar about the topic. Oh how I’d love to add this cookbook to my collection. I have one for the 1950’s from my hubby’s great aunt. She’s got notes written all over it. I just love it! I would just love to have this book! Vintage X2 what a great deal… Thanks Suzanne!!! I would love to win this cookbook to add to my collection! Great giveaway. Please enter me, I would love to have a copy of this cookbook. I’m pretty sure I have seen that cookbook before, on my Grandmother’s kitchen shelf. Unfortunately, I don’t know where it went after her death – probably to one of her daughters (she had eight kids total). Having that book would be like having a piece of my Grandma living in my kitchen. How cool would that be? I love this second chance…..Please enter me…. Please enter me in the giveaway for the Rumsford Cookbook. Cookbooks are so much fun to read. Better than the Enquirer!!! Please enter me for a chance to be the keeper of this wonderful cookbook. Count me in for the contest!! Would love to win one! I collect interesting books of all kinds (previously owning an online book store), & hubby collects cookbooks (& reads them for leisure! often trying recipes he finds interesting). The cookbook would be a great addition to my collection. Thanks for doing this Suzanne! Thanks for the interesting history. I would love to win this! I love all cookbooks….however, the vintage cookbooks always hold a special place in my heart! Thanks for offering us a chance for one of the books! Old cookbooks are fascinating. I enjoy old books and cookbooks often make me feel as if I were somehow connecting with the past in a special way. count me in… love the history of it all. Thanks, MMHoney!! Please count me in! I would love one of these books to add to my library. Please count me in, I love old cookbooks. Merry Christmas! I would love to win the drawing. I would loveto be entered to win! Such interesting history linking Clabber Girl to Rumford! How neat! I own a few vintage cookbooks (passed down to me from my mother and her mother..), so it’ll be cool to win a vintage cookbook! Count me in! Count me in! Would love to add to my cookbook collection! Thanks Suzanne and Merry Christmas. I really want this Rumford cookbook! I love vintage cookbooks. I hope that I can win this one. I love second chances… sign me up!! Suzanne, I want you and MMHoney both as neighbors. Thank you both for this most generous and lovely giveaway! I would love to have a vintage copy of this cookbook! Please enter me in the contest. I would LOVE this book! Rumford was big in new England. 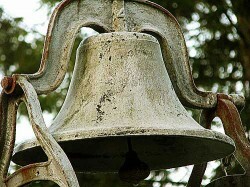 My mother & grandmother used it! I have Rumford in my pantry right now. Yes, please include me in the drawing. Thank you! Would love to win a copy of the cookbook. Thanks! I have used Rumford before. I would put that vintage cookbook to good use. Please enter me in your drawing. Thank you! Please include me in the drawing!!! I would love to win the vintage cookbook. Awesome another chance to win this great cookbook! Please enter me for this drawing! I love old cookbooks and collect them! I have over 50 cookbooks in my collection. I love old cookbooks. I read them just like others read a mystery novel. Entering in this section, also. Thanks Suzanne and MMHoney. What a great giveaway, Suzanne! Yes, please enter me for the 1948 Rumford Cookbook. Thumbing through all the new cookie recipes at Farm Bell, and a second chance to win a heritage cookbook. What better way to spend part of my day? Serious collector of cookbooks, here! I would love to receive one of these. I love looking at older cookbooks, I remember some of the recipes that are “out of style” that my Grandma and Mom made. Thanks for the chance to win the Rumford Cookbook! Please count me in the drawing for the VRC! Thanks! Thank you for the chance to win the vintage cookbook. Hope I’m one of the lucky ones. I would so love to win this. Cookbooks are my weakness! Yes, please! I would love the cookbook! I just finished a can of Rumford baking powder that was given to me by a dear friend. Please enter me for the drawing. I’d love to have this cookbook! Thank you for 2 chances to win, yay! I just adore all old books – to my husband’s angst. I would love to win one. Thanks for the chance. What a neat idea….would love to be able to add a cookbook to my collection….thank you Suzanne! I use Rumford (Aluminum-Free) Baking Powder all the time her in CA. It comes in a nice little red container with the counterfeit of Count Rumford above the brand name and a “golden” plastic lid on top. Thank you for the chance to win such a precious cookbook. I would sure like to win it. I love vintage cookbooks! Enter me please. Thank you for offering this giveaway, Suzanne! Please enter me for the drawing. I love the old cookbooks. I’d love to win the book & if I don’t, I might see if I can find it on half.com or ebay…it sounds very interesting….Thanks MMHoney & Suzanne for this gift to the lucky winner! I would love to own this cookbook! I’d love to add this to my collection of cookbooks. Yep, me again, #200 on the other thread! 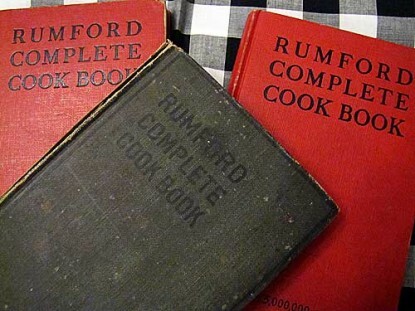 I really would like one of the 1948 Rumford Cookbooks!! Pick me, pick me, over here, pick me! I do love this site, regardless if I win a free antique cookbook or not! I’d love to be in the drawing! It looks like it would be just my style! I would love to have the cookbook. It would be priceless.